Soccer and miracles. Screenshot anime Aoki Densetsu Shoot. The anime has lots of pictures like this, and some hair-raising music too. There are some things you would feel safe to bet a large sum of money on. Large sum of money as in borrowing to the chimney to bet. Somewhere around that level of certainty was my conviction, unspoken because it was so obvious, that I would never write anything that had anything to do with soccer (or indeed any sport, but particularly soccer). Well, not anything other than “I hate soccer and wish it was dead”, or words to that effect. As you can guess by now, I am writing soccer fiction. At least it is not about actual real-world soccer players and their imaginary guy & guy love adventures, which seems to be a very large proportion of the soccer fiction on the Internet. -_- I guess girls have their temptations too, in addition to chocolate cake I mean. And like most things regarding girls, completely incomprehensible. Inscrutable. Obscure. Â Impossible to understand. 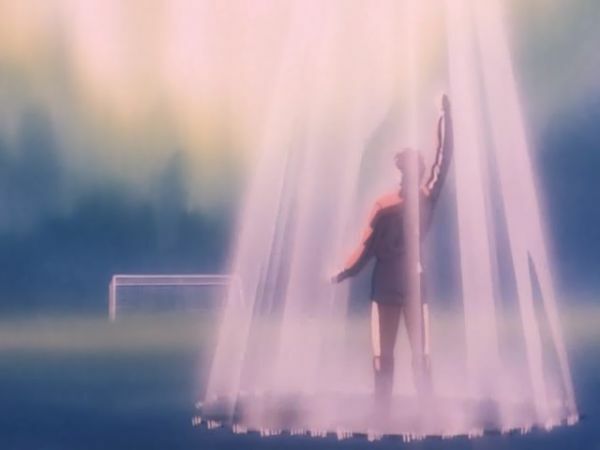 In any case, I have finished watching all 59 episodes of Aoki Densetsu Shoot, a Japanese animation about soccer. And as usual when I have seen come across something interesting, I started to thing of writing fiction. Not fan fiction really, but the usual. You know, the usual for me is to take the most basic concept of a movie or book or something, then condense it down to a couple lines, and expand those lines into a whole new story which is so different, it cannot be recognized unless I give you the seed. In this case, the condensed version is: “Talented boy joins soccer club, has adventures and wins miraculously. Girls appear, chaos ensues.” OK, the last two words probably go without saying, but only for us guys. My main character, which I at least for now call Martin, takes an interest in soccer after he has to move to another part of the country and live with relatives to go to high school. (This is something I actually did. Everything after that however is so very much not me.) He moves in with three girls who are his cousins. Their father is usually away at work, though he comes home now and then. Apart from being his cousins, they also each have some trait that makes them less than attractive: One is too old for him, one too young, and the one in the middle is boyish, selfish, overconfident and hot-headed. The middle girl is in the small town’s girl soccer team (actually captain there, but he does not know that until later). Trying to be friendly, he takes an interest in soccer. She teaches him some techniques that go beyond grade school when he last tried to play. After this, during a dream at night, he has an epiphany and becomes One With The Ball. From now on, he can impart his will to the ball just by a touch, and the ball will do whatever he tells it. Simple things at first, like hitting a particular point, but it gets gradually more unlikely as the story progresses. The story henceforth alternates between his adventures with soccer and his misadventures with girls. In particular Cornelia, the overly aggressive cousin & captain of the girls’ soccer team. Actual quote: I think it says something profound about Cornelia that in her vocabulary, “people skills” means the ability to throw people around and knock them down without getting arrested. Onlookers see her rough behavior toward him as sign of them being very close romantically, much to his despair. Then there is his classmate Helene, who is volunteering to help at the soccerclub. She has a crush on him, but being a boy, there is no way he can notice. Then there are an ever growing crowd of nameless girls who want to be seen with him once he starts getting famous. There should be at least one more girl, and perhaps a boy, to make chaos complete. But I am not finished plotting it. I have written some 14000 words over the last couple days though. I basically leave most of the work to the muses in my head, as usual. So writing it is kind of like reading a book, except much slower.